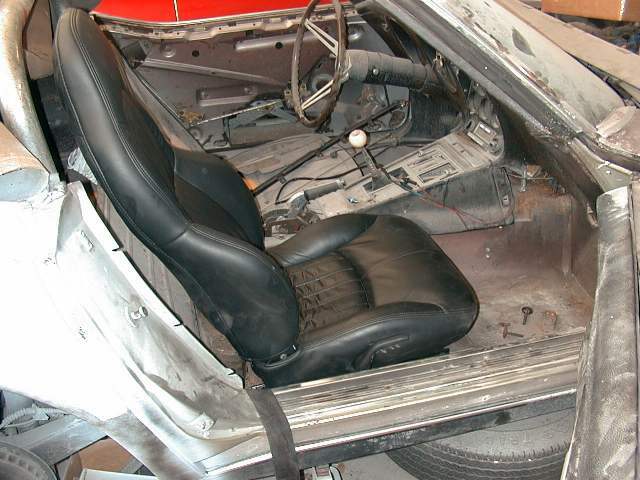 Corvetteforum: C 5 Basic seats in a C 3 Howto. 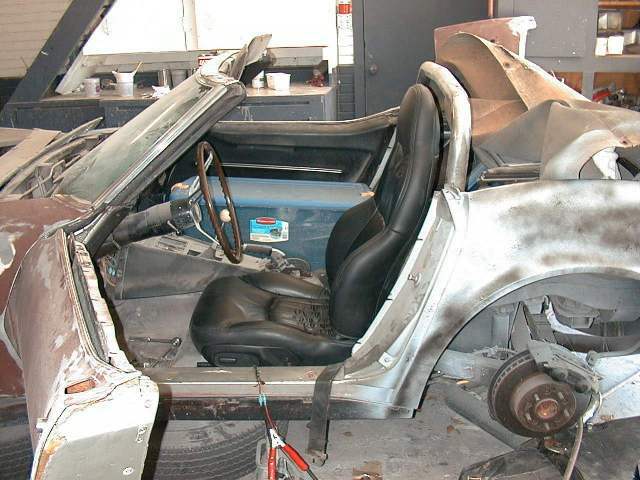 Corvetteforum C3 Corvettes C 5 Basic seats in a C 3 Howto. Well one can put the base C 5 seats in a C 3. I bought a set from a C 5, you get one manual seat and one power seat. First thing you have to drill out the rivets for the frount bracket. Photo with bracket. Bolt it down and you are done with the pass. side. Note the seat height compaired to the stock driver seat. If you use a manual seat on the drivers side then the install would be the same. However I chose to install the power seat which requires two notches in the floor. Note the cut on the tunnel side was too wide it can be the same as outside. One also has to cut the frount lip of the brace that runs under the floor. I plan to patch the holes from underneath later. The best way to get a feel for where to cut is to put the seats with one bolt in with a in or so play in and operate the controls which will leave scratches on the floor. When you put the seat in to drill the holes use the outer frount stock hole and the inner frount track hole and the position will be about right. Very impressive! Those are some really nice seats. 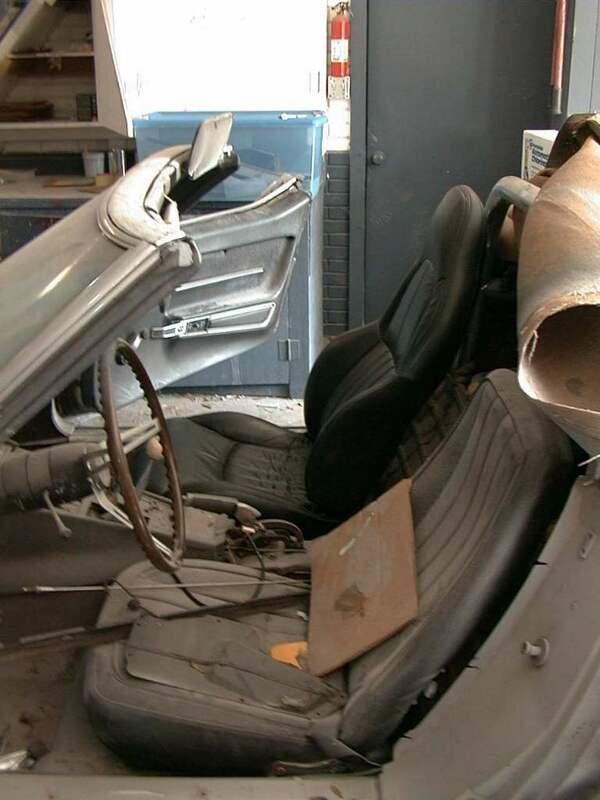 Make sure you post some pictures after the rest of the interior is installed. I know it is going to look really good! 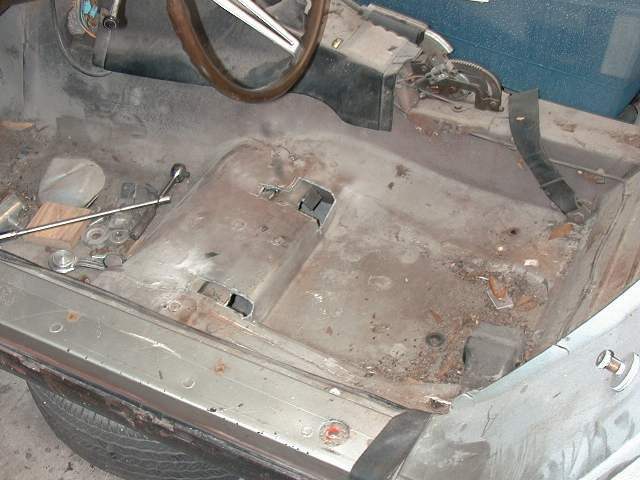 With the stock seats, are you drilling holes in the C5 seat bracket, or are you drilling holes in the floorpan of the C3 and putting new holes below? I would like to do this mod! 1976 Stingray W/'95 LT1/4L60E 16" Torq Thrust II W/Yoko 255/50, Vette Brakes front mono spring suspension system with 1-1/8" front sway bar & 3/4" rear sway bar. VETTEWORKS C3 Harness Bar and fire extinguisher bracket, Autometer 5" Pro Comp Electronic Speedometer/tach and VAT alarm, Blaupunkt San Jose MP41 MP3/CD player. MSD 8.5 plug wires, Part Number for the American Racing wheels I have is 5056861. Best 1/4 mile so far is 13.600 sec @ 100.25 MPH. Is the base of the c5 seat higher then the base of the c3 seat (do you sit higher)? Does it go back as far as the c3 seat or are you forced to sit closer to the wheel? Also, how is your roll bar mounted? I am planning one and would really like a picture if you could. Does it clear the soft top mechanism? I could use a little clarification as well, what is bolting to what and in what holes? And how much higher do you sit vs the C3 seats? Can you measure that for us? Pleasssssssse? I'm so curious because I have a pair of C5 seats (sitting in a BR closet), both power and I'm planning on rebuilding the whole floorboard 2"-3" lower and providing inlayed nuts in the C3 floorboard for the C5 track bolts. But don't intend to undertake that task until the body is off. I used the holes in the C5 seat track track as a guide to drill the holes in the floor pan. Used new bolts/nuts/washers and a 2x2 1/4 in plate on the underside of the floor pan as backing. Since I retained the stock floor mounted belts I am not worried about it coming through the floor in a crash. If you look at the picture with the new and old seat you see that the manual seat sits at the same level as the stock seat IF you drill out the rivets that hold the frount bracket. (THEY ARE HARD METAL). 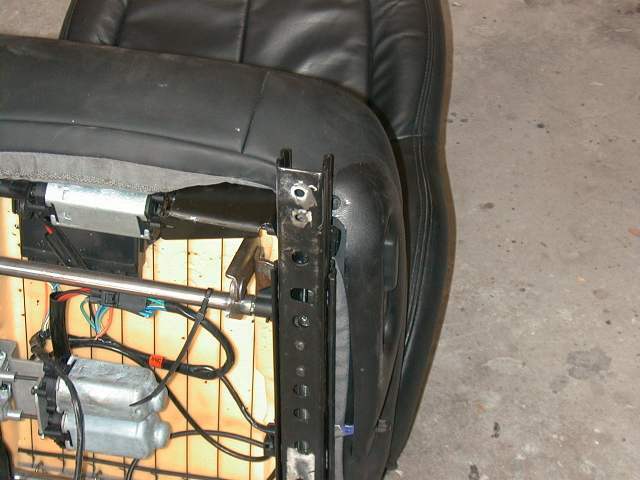 You do not have to do major surgery to the floor pan to make the Base electric seat fit. I do not know if the 6 way seat has more under seat levers than the base seat. As you can see it takes 2 cuts about 2 in wide and 4 in long in the pan and a 2x2 cut in the underpan brace for each slot. When you turn the seat over and operate you will see the arm that pivots which is what the slot is for. As near as I can tell the seat at its lowest point is at most an inch higher in frount which is why I plan on using a 13 in stearing wheel. The back is probably 2 in thicker than the stock seat so if you are tall you might wait and try one done by someone like me to see if it fits in the max rear position. 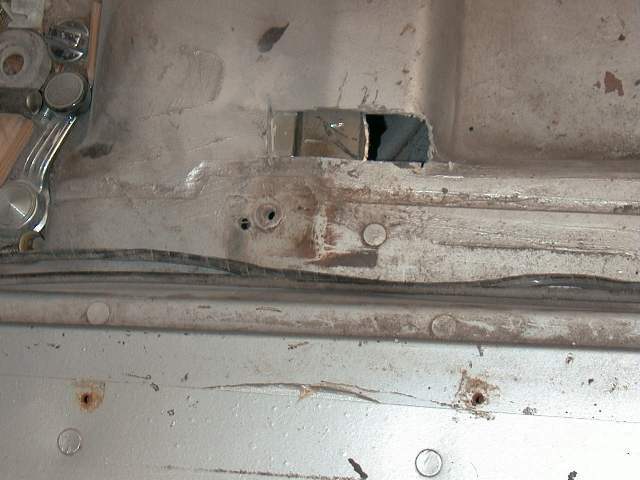 The rearward seat travel is stopped by the back of the seat hitting the bulkhead just as it is for the stock seat. The roll bar is welded to the frame and was done before I got the car, will try to make pictures next time I go to the paint shop which is where it is waiting for the guy to get done. I have to put in the six speed and 3.08 rear and hope to drive it to Monteray in Aug from Fl. Great Work!!!!! I shyed away from doing this this past summer and now I'm !!!! Looks awesome!!!! I'll have to put it back on my list of things to do!!! I could live with a manual seat on the driver's side. 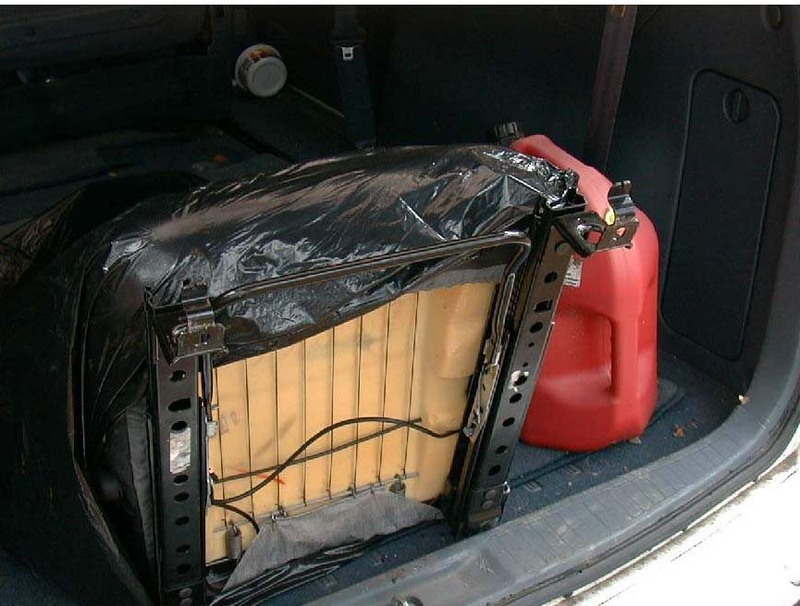 Can you get one or would you use a passenger's side seat on the driver's side?